Emerging market crises are marked by an increase in tunneling – i.e., borderline legal/illegal smuggling of value out of businesses. As time horizons become shorter, employees have less incentive to protect shareholder value and are more inclined to help out friends or prepare a soft exit for themselves. Treasury has made it clear that they will proceed with a “mix-and-match” strategy, as advertized. And people close to the Administration tell me things along the lines of “it will be messy” and “there is no alternative.” The people involved are convinced – and hold this almost as an unshakeable ideology – that this is the only way to bring private capital into banks. Will debtholders be forced to take losses and, if so, how much and for whom? As part of last week’s Citigroup deal, preferred shareholders – whose claims had debt-like characteristics – were pressed into converting to common stock. You may or may not like forced debt-for-equity swaps, but be aware of what the prospect of these will do to the credit market. Junior subordinated Citigroup debt (securities underlying enhanced trust preferred shares) were yesterday yielding 26%. Who can explain exactly how AIG has lost so much money? Drip-drip injections of government money are not a proper clean-up; there has been no complete recognition of losses and, almost six months later, that company still cannot move on. Time horizons presumably remain short or are getting shorter for all involved. This points to a bleak future more generally. The road to economic hell is paved with good intentions and bad banks. This entry was posted in Commentary and tagged Banking, treasury, tunneling. Bookmark the permalink. The public has a sense in their gut about the “confusion, tunneling and looting” as you say, but has no way of getting past the rhetoric that was preached last September and October prior to the TARP 1 party. And the threats from the fall will stay in the front of the public’s mind to cause inertia even when the truth is clear–the same effect that a robber causes when they threaten their victims that if they do anything to tell someone, surely they will regret it. I am almost out of hope that we have any policy makers who could turn the tide of what seems to be so much corruption! Yes. Sadly, what Abu Ghraib did for the reputation of the US in terms of our handling of war and terrorism, the bank rescue plan seems to be doing for our economic reputation. We talk such a good game, but in the end, actions leave the record, and Geithner’s actions have been so much clearer than his words. Simon, what is the technical definition of a Depression? …and I know I can Wikipedia this…. Is there no hope? OR should I make money by betting the house on shorting the market even further? So far the US appears to have followed the UK in policy w.r.t. big banks. If the UK ever gives up on propping up RBS capital owners from sheer size of problem and bail-out fatigue, the US might have the nerve to follow suit. Derek Wanless – Gordon Brown’s most trusted banker – who chaired Northern Rock’s audit and risk committees, also has a multi-million pound pension paid for by the taxpayer. Nobody likes change. It is shocking, painful, hard work, messy, uncertain. We only change because we don’t want to change: because the option of NOT changing is even worse than the option of changing. Shielding smokers from the truth of lung cancer is a huge disservice. So it is, therefore, very, very important that you continue to describe the full horror of the outcome of not changing from our current economic cowardice as clearly as you do here. If nothing else, keep documenting this avoidable fall (like the decline of the Roman Empire, perhaps?) each step of its spineless way as a warning to future generations. My question about nationalization is this: where are you going to get the people to run the banks once the government takes over? The government picked CEO for Freddie Mac resigned after just six months largely because of the micro-managing by government. And in another WSJ article – I’ll look for the citations of both if anyone doubts these things – Geithner indicated that the ethics rules imposed by the Obama administration was making it difficult for him to fill Treasury Department positions with qualified people. I’m trying to be open-minded about your position on nationalization, but until you address this very pragmatic facet, I’m going to have difficulty believing that outright nationalization is the best route. @ Fred: More to ponder on …. I utterly concur – it’s game over. I concluded that 2-3 weeks ago. The double-damning feature is the accumulation of US T-Bill debt and concomitant failure to execute real monetary stimulus. Existing monetary stimulus is being swallowed by private willingness to cut their own investments to support govt. investments (e.g. buy T-bills rather than invest in private companies). That new stimulus from China? It’s not really needed. A budget deficit of 3% of GDP, a small fraction of the foreign currency reserve, will be sufficient. The ECB continued with their “bold” moves and cut interest rates by 0.5%. Utterly laughable. I will disagree with you entirely about inflation triggering confusion in the current environment. The real source of confusion has been UNCERTAINTY about inflation. The key to inflation is how it is managed – in other words, that it’s expected and not excessive. Had the US inflated when it was expected to inflate – back in November, or even January/early February (when Obama took the reigns), the markets would have taken this in stride. This was, to some degree, expected. The amazing feature in the financial markets, however, has been around the currency issue. For the last three months, expectations have been anything BUT a normal distribution (bell curve). Instead, expectations have been highly polarized, as the market grasps for signals pointing one direction or another on the inflation issue. The outcome we have – muddling through – has vastly increased volatility, and hence fear, and that fear means that those individuals with more/faster information end up pilfering from those individuals without (e.g. retail investors and 401k owners). All market action recently has ceased to be investing and instead become risk arbitrage. Had the US specifically stated an inflation rate (preferably higher than 2% since that just isn’t cutting it right now), and actively targeted that inflation rate, I suspect we would all be better off right now. All of this, however, goes back to our obsession with the banks – which have been held up as the “key” to this crisis. This is entirely a fallacy driven by our dependency on banks to sustain the money supply through credit, and our obsession with fighting the last war (e.g. Japan 1990s). This is not Japan 1990s. This is global – it’s the 1930s, but faster. The inconsistency is patently obvious to everyone on main street – there’s too much debt… so, the govt. solution is get the banks to extend more debt? The real problem is that pricing support for assets was dependent on money supply which was (because of over-leveraging) inflated. Everyone agrees that credit supply should NEVER have been that large, particularly given trade deficits and failure to improve domestic productivity and flat real wages. The real solution is to increase the money supply to stabilize asset prices without recreating debt, and that means printing money. Pure and simple. The alternative to debt-reduction through inflation is debt-reduction through bankruptcy, which is OK in moderate doses but is disastrous when it occurs globally. So pick your poison? I prefer inflation to Great Depression 2.0. We. Are. Not. As. Rich. As. We. Thought. We. Were. Instead of seeing this, the shifting of vast debt from private to public hands is the last gasp in our attempt to sustain our consumption levels. In doing so, it is likely to cripple the US indefinitely. Very very simple math – the number of employees per retiree is going to shrink from 3.5 to 2 within a decade or so. The US economy and tax revenue is shrinking. Spending is shrinking. Yet debt is increasing. Debt as % of GDP thus gets the double whammy. If Team Obama’s plan fails in its timeline (which is highly likely given the rest of the world’s even more lame response), future federal debt load will become unsustainable. We dug ourselves out of WW2 debt only because we had most of the world’s manufacturing base. We are now net debtors on a continuing basis – we aren’t going to dig out of this hole. That means the failure to devalue debt now through inflation will have catastrophic consequences down the line. And precisely then will we see the type of inflation that obfuscates value and creates opportunity for self-serving behavior that is socially destructive. We are walking, eyes wide open, into national insolvency. The Republicans have this part right. But their solution – cut all spending – is utterly wrong. Thanks for adding the word “tunneling” to my financial vocabulary. After glancing at the kindly provided Wikipedia link the meaning of this old word in a new context became abundantly clear as an apt description of a phenomenon that I had seen but never heard so aptly named. Another way of saying precisely the same thing, and I understand why you don’t choose to express it this way, is that it is becoming clear to market participants of both sound and sinister intent (the boundary between the two is fluid) that Obama and his team are simply not up to dealing with this ongoing collapse. My experience has been that once this happens on this large a scale, a given team of people will very rarely regain control. Credibility is a critically needed resource, and once squandered is rarely reacquired. Things only turn around after the people are replaced. As my teenage daughter would say, “epic fail”. The USG need not change the leadership of these banks, but it should tell them what to do at a strategic level–just as a good BOD should have. Leave it to the bank mgmt. expert to carry out the direction. If he/she can’t, then fire him/her. The keys here: USG strategic guidance, not day-to-day interference, and effective implementation of that guidance by management in place–or the door. Assisted in no small measure by your reporting and commentary, we now better understand the Treasury’s plan. But the question of “Why?” the Treasury is pursuing this plan remains begged. Your commentary and insights would be appreciated. While I recognize that you may be reluctant to answer this question,… to what extent might current management of the bailouts be driven by international political considerations that “require” that “our leaders” pander to powerful foreign interests? Is there an unstated “quid pro quo”? To what extent do the “powerful world elites” perceive the U.S. as the epicenter/cause of the global meltdown and the “quid pro quo” is “compensation”? If we can keep our humor, like you seem to have about this financial mess, we will be OK. This dovetails nicely with Simon’s post on 3 Mar 09 (Did Goldman Sachs Just Win Big? ); to wit: Hank Paulson ensuring his alma mater and others of its ilk are held harmless in the ruinous trades they’ve put on. That bit of maneuvering by Hank was absolutely brilliant. The FT link to Lloyd Blankfein’s op-ed in Simon’s 3 Mar piece offers a truly dazzling display of rhetorical misdirection: We are led thru a laundry list of plausible defects in the “risk management” practices of these failed institutions. As if these problems had just been discovered. As if common sense didn’t dictate more prudent behaviour than what we’ve witnessed at these institutions. As if every G30 report to come out of every crisis since it founding didn’t say exactly the same thing. And yet … and yet … the prima facie cause of the destruction of the capital markets and these financial institutions goes unaddressed: Who has yet answered for the reckless piling on of massive exposure to a single counterpart, which could not possibly be supported by a balance sheet other than the US government’s? So far, no one at these institutions has been held accountable. The Congressional Democrats are pontificating about the need for some sort of “Truth Commission” to look into the misdeeds of the Bush Administration, and no one wants to get to the bottom of who drove the global trading markets to ruination. Or who benefits most from the tunneling now evident at the highest levels of our financial institutions and government. If we’re going to follow the path of the Romans to a society where the elites bend law and institutions to their will and for their benefit, we should at least adopt the old Roman ways and ask Cui bono? If for nothing else other than the spectacle of such brilliant sophistry on display. Geithner’s wholesale dismissal of alternatives–“nationalization is not a good strategy”–is condescending. Bernanke’s dismissal, however, seems slightly more pointed and possibly worthy of exploration. In Congressional hearings last week, and this week before the Senate Budget Committee, Bernanke responded to members’ questions about the possibility of temporary nationalizations by saying “we do not have the tools” to nationalize. If we take that seriously, and I don’t see why we shouldn’t, the obvious suggestion is: the critical difference between our banking crisis and the historical case studies involves something other than scale. On its face, that’s not implausible–not having the tools could mean human capital, regulatory authority, or a variety of other things…each arguable, but the public debate would be advanced by clarity on how the crisis differs from historical ones in matters other than scale. So the question is precisely what is Bernanke referring to? Perhaps members of Congress could respond to “we don’t have the tools” with a followup question for the Fed chair: “what do you need?” After all, Bernanke was pretty blunt about his feelings regarding AIG the other day and even challenged the Congress to come up with a better plan. M. Cuadro, there is no shortage of qualified personnel to run the banks. As a mid-level compliance officer who has been at both HSBC and Capital One, it is clear to me that there are capable, honest individuals who have argued against many of the practices that led to these problems that would be able to step in. As a starting point, the government could simply review the files of those who were dismissed from their positions for raising concerns. That group is likely far larger than the existing management team would like to admit. Actions can be deliberate an non-conscious at the same time. That is, we act according to our biases even if we do not know it. Movement of the large banks toward the ‘looting’ scenario has been quite deliberate action by our government due to the backgrounds and focus of people at the Fed and Treasury. It may not always be clear today, but it will be so in a decade or two. Simon, thank you for providing your penetrating insights. While I am like you deeply concerned, the fact that there are blogs such as this where hard choices can be discussed openly is an indication that there is hope. The government hasn’t the guts to tackle the banks and whining about it isn’t going to change that. That means it is down to the rest of us to do something. Wired’s suggestion of “crowdsourcing regulation” (see http://www.wired.com/techbiz/it/magazine/17-03/wp_reboot?currentPage=all) points the way to go. Simon and his worthy colleagues don’t have to solve all the problems by themselves. And they are missing a trick if they think they do. They could do more to blow away the deliberate obfuscation of these confused policies. For example, add a Wiki to this site with topics like “AIG bailout”. This would pool collective knowledge of the true value of government action, especially if it were somewhere insiders could safely contribute. So,… isn’t the real question: Who would be the biggest losers if “our too big to fail” institutions were truly nationalized? Follow the $$$? While it is absolutely “understandable” that many of our elected “representatives” are too beholden to the potential “big losers”,… there must be a couple of folks in Congress who have the chutzpah to pursue these matters? I again pose a question that I raised weeks ago: How can/do we transform an intellectual blog exchange into political pressure? Who are the potential Congressional representatives who might be receptive to pursuing these questions? When do we start the writing campaign (as the powerful elite work the halls of Congress and our national financial bureaucracies)? Great post. I think your AIG comment gets to the heart of the issue. People are currently using ‘nationalization’ as a synonym for ‘responsibly recognizing losses and moving on.’ AIG shows that nationalization doesn’t necessarily mean quick loss recognition and cleanup. I think when you talk about nationalization, you should focus less on the legal concept, and more on the importance of honestly clearing losses. Obama could go a long way towards honestly clearing losses merely by acknowledging the true cost of the eventual cleanup clearly and publicly. In some ways, that statement is the big hurdle. Once people have accepted that there are going to be huge losses that impact the bondholders and taxpayers, a quick nationalization/re-privatization will be ‘easy’ in the way that you keep saying it is. At that point, its just a ‘technical matter’ to do it. But right now, the administration is using technical excuses (‘its to hard to nationalization’) to avoid a political problem (people are going to be angry when they find out the true cost). I think it is interesting that if someone were to conspire to destroy the nation, it would be considered treason, yet bank/corporate executives who destroy the national economy by their corrupt self-serving looting of the organizations that they have a fiduciary responsibility to protect, are given golden parachutes and huge federal bailouts. This corruption is destroying the U.S. national security before our very eyes yet those responsible are not being held accountable. Question: What happened to the rule of law and not of men? When the top leadership is corrupt and clearly unwilling to hold the elite responsible for their anti-social behavior, then piracy runs wild. How long will it be before the second American revolution causes violence and social unrest, setting us back for decades if not centuries? If we don’t remember the fundamental concepts of malfeasance, misfeasance and nonfeasance, this nation may be doomed to collapse. Couldn’t someone invoke Sarbanes-Oxley, RICO, and maybe Andrew Cuomo and his help? Can we the people have a “class action suit” to demand answers? Does this message get transmitted to the original blog comment author? I’ve come to the same conclusion. The debt is going to get written off by choice, by bankruptcy or by inflation. I’d much rather go down the inflation road. Any shuffling the deck deck chairs (what’s currently going on) only wastes time and makes the amount needed inflation bigger and more dangerous later. We have elected a black Bush. Hurray for the new boss! Speaking of pennies and failed WaMu execs buying up failed WaMu mortgages, failed Countrywide execs are buying up failed Countrywide (and other) mortgages. It’s called Pennie Mac. How quaint. Tunneling isn’t only going to happen at the banks, but also in the auto industry as well. And then Healthcare, Insurance, etc. Despite the pain it will cause us in the near term, it seems the best solution – if there is one – is failure. Let the banks and the autos fail, from their ashes we will find a new model. The banks need to be in bankruptcy proceedings outright. A bankruptcy sell off is going to happen anyway. All the US is doing right now is lining pockets before the sell off begins. It is too late to save banks whole and worse for the long term. Assets need splitting up and sold on an open market like any failed entity. The USGs role in this is to minimize 3rd party losses by buying bad assets and insuring third parties where appropriuate. But chapter 11 would mean the cost is at market prices: open and transparent. Simon has regularly and rightly pointed to experience in financial meltdowns in emerging markets as offering useful lessons. For example, my first reaction, when I heard about Paulson’s 2-page “plan” for TARP was that, if such a proposal had been presented by officials from Indonesia or Korea during the Asian crisis, they would have been laughed out of the room at the IMF. And the Paulson-Bernanke Congressional testimony on pricing the TARP assets was wishful thinking at its most embarrassingly absurd. But I think we can go too far in pressing emerging markets analogies. Does lack of clarity in what’s going to happen to the big banks add to our economic problems? Absolutely, the credit markets have been paralyzed by uncertainty. Though I think the equity markets are finally pricing in the bad-news-to-come — Citi isn’t the only bank that will break the buck. But let’s be careful about identifying where the problems produced by uncertainty actually lie. I don’t think we’re facing any of the sorts of risks of tunneling that countries like Russia (or Indonesia, Korea, etc) faced. That’s because, despite the continued political clout of the US financial sector, we don’t have the totally incestuous industrial-political-financial capitalism of emerging markets where tunneling and lootiing were major risks. For example, the risks Fyedorov was battling were part and parcel of the battle-to-the-death for control over Russia’s natural resources and the bits of the Soviet industrial sector that had some value (principally real estate). The Russian banks were tiny players in terms of size of capital, but were one of the main mechanisms, especially after the “loans for shares” scheme, through which the oligarchs and their political patrons could obtain effective control over assets, including looting raids that left asset-stripped corporate shells behind. The Asian versions of crony capitalism weren’t as extreme as the struggle for Russia’s natural resource wealth, but the bank-corporate-politician nexus was still central to the puzzle of how to resolve their financial sectors. What happened to a bank would also have important implications for who would wind up with the greatest interest in the “commanding heights” of their economies. The mushy bail-out terms that Treasury and the Fed have been devising for AIG or Citi et al don’t have any of those implications. It’s true that the shareholders aren’t being wiped out up-front, but it’s now clear that these institutions are effectively nationalized, the shareholders are being diluted to the point of vanishing in any meaningful economic sense (share price or control stakes), and the government is going to do everything in its power to keep creditors whole (at least senior, depositors and trading counterparties). So because these institutions are being effectively nationalized, whether a convertible security is convertible at the option of the government or the bank is, quite frankly, of no importance. Whether the conversion price is today’s market price or last month’s or next month’s is, to put it bluntly, completely irrelevant for the government and only relevant for some future stage of bringing in private capital when the institutions are “reprivatized”. There’s no “tunneling” or “looting” possibility from those mushy terms because there’s no control mechanism where by insiders can game the provisions that apply to widely held classes of securities. 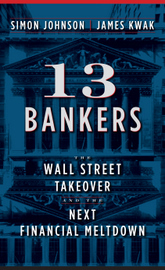 The more serious risk to a murky unwinding of the US financial sector is the S&L one-way-bet sort — where S&L owners/managers were able to place extraordinarily risky bets with what were in effect government funds — if the bets paid out, they got the whole upside, and if the bets went sour, it was the government that footed the bill. It is my impression — and I hope I’m not wrong — that AIG is basically in wind-up and there are controls over the sorts of new risks that can be undertaken. I’d expect Citi and the other “stress-test” club to be in the same position — or if they aren’t already, will be pretty soon in order to regularly demonstrate to their watchdogs that they’re on the road to making their balance sheets viable. So let’s talk about the real costs of murky plans and ongong uncertainty. And whether those costs are the unfortunate price we may have to pay to avoid a global meltdown if Treasury were suddenly to formally “nationalize” a number of big banks and impose a significant haircut on senior creditors or trading counterparties. There are lots of reasons to be unhappy about a muddling-through program, but I don’t find it helpful to add some unconvincing additional reasons to be scared of the muddling through option. What has changed in one month that suddenly nationalization seems like the only viable option? BTW, I support nationalization (and think we have already effectively nationalized Citibank as suggested by keeping on Pandit and the forced debt-equity swap) but I don’t think we are being fair to the administration. Where can I buy good quality cheap topsoil? Why would you assume their intentions are good? I suspect they are not. You are a brave man Simon Johnson. Keep writing. You have a wide audience of people listening and we’re not all wonks. We’re kitchen counter economists. We’re like the 80 million people old enough to be members of AARP. At some point even the Fed has to recognize we’re here and we’re not liking what we’re seein happen. It looks too much like Russia after the fall of the USSR, as Soros described, “first the oligarchs canabilized the state. Then the oligarchs canabilized each other.” We’ve seen this movie before and it doesn’t have an ending that blends well with our idea of democracy. Did anyone read the news today about the NY Attorney General subpoena battle with Bank of America over their paying of $3.6 billion in “bonuses” to Merrill executives when they took them over? The NY AG is trying to discover what happened. BOA attorneys are warning the court that disclosing the “bonus” details will cause “grave and irreparable harm” and should not be made public. I hope this does not turn out to be the perfect example for your essay. Just to be safe, I hope everyone has sold their stock and their dollars and has their passports updated. Nadezhda argument reinforces my preconceived notion that the situation is so bad that actual rather than creeping de facto nationalization could make matters much, much worse. What makes this policy less than appealing is the presence of Summers, Bernanke and Geithner who do not instill confidence because of their previous positions and decisions or lack thereof and lack of credible upfront explanation of the reasons for this policy. At the same time Krugman’s recent criticism about the size of the top four US banks seems misplaced. I suspect these institutions are larger than all the Nordic banks combined and more complex by several orders of magnitude. Much current criticism of the present policy runs the risk of being both premature and ill informed. However, continuing insistence on better, more transparent explanations is neither. I would be surprised if the FDIC had to step in as conservator or receiver of a large, systemically important institution. The regulators’ Joint Statement last week restated our commitment to preserve the viability of systemically important financial institutions. This will be done through capital injections, if needed, and the supervisory process. If more direct intervention to take over a large financial group is needed, that will present significant challenges. The main hurdle is that there’s no clear process for resolving a large financial holding company with multiple affiliates. We have a process for dealing with large banks, but not financial conglomerates. 3. Other countries have regulatory oversight of these financial conglomerates too, and they may object to a U.S. takeover. Maybe the US government might increase Trade Barriers until the National economy reaches a balance. This will transforms big banks into smaller ones or a National bank consolidation may occur. But the US is trusting that the rest of countries will collaborate in the global stabilization effort but this is not what is truly happen. What looks like is happening is the world countries are waiting to see how the US save the word. Obama is not Superman. Clean the House first and then you can go out and help others to clean their house. Cleaning must come from the inside out. I could not agree more with this analysis. I spent many years investigating fraud in financial institutions. Here is what I have learned. Criminals do not generally become CEOs of major companies, but there is a slide that starts when the incentives go upside down. It starts with a bad business decision. When things start going south, they hide it for as long as they can. When they can’t hide it any more, they shuffle and stall while they move money off shore. In my judgement, that is what we are seeing now. I’m an economist, and it pains me to say this, but we need to nationalize now. Proves my point: See you at SPX 150, within 24 months. These points seem important, especially regarding the FDIC. I read in the WSJ that the FDIC is in need of money from treasury as we’re losing around 2 banks a week. I have no idea how much C would cost the FDIC if nationalized, but I would imagine it’s breathtaking even in this climate. Maybe Simon could provide some insight in this regard. . . In an interview George Stiglitz gave to the FT while in Paris recently, he said that the Treasury department has historically been the protectors of Wall Street interests. Could you comment on this assertion? I tunneled before leaving my dead-end job. I spent every morning for a couple of weeks printing off copious amounts of articles of interest off the Web and cleared all of the excess ketchup packets out of the office fridge. Is someone trying to position himself as the Lou Dobbs of finance? Why is no one protesting the financial regulators? They allowed a bank to hold only 1.6 dollars in equity for a 100 dollar loan to a corporation rated AAA or AA-… a whooping 62 to 1 leverage. Why is no one protesting the financial regulators? They empowered the credit rating agencies to serve as official guides in the world of risk defaults and which caused these, with their AAA signs, to lead a couple of trillions of dollars over the subprime cliff. Ideas on financial tsunami, AIG, TARP, etc. are parsed by writer William F Engdahl in an article titled Financial Tsunami(engdahl@oilgeopolitics.com} in which he labels TARP as “crass”, outlines relationships between TARP and AIG, and finally, analyses the process followed by Sweden in the 90s, to reclaim and recapitalize its banks. Re: Relationship between AIG and Goldman Sachs: Engdahl describes a number of items relating to what he sees as conflicts of interest. If his descriptions are accurate, a key piece of a large, expensive puzzle could drop into place, or at least call into question prevailing ideas. I blush before providing the correct URL for Professor Engdahl: it is engdahl@oilgeopolitics.net and not .com, as in my first mention. Apologies, all. Yes, yes, yes everything will appear to be confused as long as we perceive the confusion to be right/wrong, good/bad. The ONLY way to heal the global confusion is to HEAL our individual perceptions. If we heal individually FIRST, then healing will carry into the collective WHOLE. Everything discussed here is merely a discussion of SYMPTOMS of ‘social consciousness’ or ‘global thoughtform’. We think from fear-based perspectives therefore the world’s issues (symptoms) are never treated. We look for another ‘pill’ to make the illness go away but the ‘pills have side effects’! That means NO CURE! Everything ‘mirrors consciousness’ . . . therefore we must correctly attempt to heal the ’cause’. The cause to ALL symptoms is rarely addressed. Whatever WE individually/collectively hold in our mind (consciousness) is what we will experience individually, regionally, globally in our material (hunt for survival) existence. What we need is a wiki for non-politically aligned global citizens to fight back. A transition town/resilient community version of informed and directed vigilantism. We gather information on the elites, and our future enemies after the elites leave us (or are killed off). We need information on where they are, photos of them, maps of their social networks (friends, family, business partners). Raw information, analysis, and systems picture of them. Everything about them. So when the time comes, we take them out through good and actionable information (something that vigilante groups often lack). A combo of open source intelligence and open source covert action. Given that I subscribe to the Italian sociologist view of warring elites, it’d have to include rising elites as well as current elites. None of them can be trusted and will try screw us for their own self-interests and delusional ideologies. (4) violent underclass gangs (bloods, crips, outlaw motorcycle gangs, MS-13, skinhead groups, narco-based trafficking networks). We need to stay ahead of the curve, work out who and where they are, their intentions, and so on. Posted by Paul Murphy on Mar 07 18:34. It’s a deceit on British taxpayers, not Lloyds shareholders, who are getting a free and gloriously pimped ride. This seems to fit well with Confusion, Tunneling, And Looting. Glad I’m not a UK tax payer. I have suggested this before, so pls bear with me or skip this post … On the Centre for Global Resarch web site, you will find the following recent article which seems to be both relevant, timely and interesting. It is titled America’s Fiscal Collapse . The writer is author of The Globalization of Poverty. The “bank bailouts” (involving several initiatives financed by tax dollars) constitute a component of government expenditure. Both the Bush and Obama bank bailouts are hand outs to major financial institutions. They do not not constitute a positive spending injection into the real economy. Quite the opposite. The bailouts contribute to financing the restructuring of the banking system leading to a massive concentration of wealth and centralization of banking power. The first thing I thought of is e-looting/e-hiding while they can get away with it. “I take the view that it is inevitable that the members of the ruling elites would go for each other’s throats because those who were given the charge to ensure that the money-machine keeps running have screwed up big time. Someone must answer for the fiasco. It would be naïve to assume that the status quo would remain, when the Global Trillion Dollar Casino is for all intents and purposes broken down beyond repair. NEW YORK (Reuters) – Chief executives of leading banks from Japan, Europe and the United States will meet in London to discuss regulation of the financial sector, AFP news agency reported, citing the Nikkei economic daily. According to the report, which did not name sources, the British government will host the meeting on March 24, after the Group of 20 (G-20) finance ministers meeting in London this coming weekend. The report said invitations had been sent to leading institutions including JPMorgan and HSBC. It said Mitsubishi UFJ Financial Group president Nobuo Kuroyanagi would attend. Leaders of the G-20 nations are due to meet in London on April 2. Spot on. In the wildest dreams of the enemies of the USA and capitalist economies everywhere, they could not envision any operation effecting such destruction. Corrupt individuals who destroyed our national economy for their personal gain ARE the enemies of the US. This includes the financial industry from CEO’s of banks and investment banks down to mortgage brokers, it includes Bush officials who gutted the regulatory systems they were supposed to manage, it includes the legislators who accepted pay to look the other way or to actively legislate in favor of the looters. If we were to put on trial and deal with everyone who has worked to destroy our country, the streets would run red with their blood. I agree. The sooner this corrupt kleptocratic system falls of its own weight, the sooner we can get to the hard job of building something better. I don’t get it. Has Paul Krugman been unaware that this is how for instance a Fannie Mae has functioned for decades? Where has he been? I guess you haven’t heard of MAX KEISER!!! Get to youtube. He’s now got a show on BBC called the Oracle….he goes off on the crooks this week….check it out!! I honestly do not see what there is to enjoy of this Mark Keiser hysteria. It is just another “I knew that they knew it all the time yet I did not say a word about it” blog. for a bit of light reading….a piece in Mar.8 NYT magazine..”all boarded up”. Similarly, I read Hank Greenberg is siphoning off commercial insurance accounts into a new company. We bail; He skims. It might be a good idea to not let bailed out people go back into the same business (especially while we’re still bailing), because ditching your loses this way will really catch on. Tunneling. Great word for it. Looting. Another great word for it. Per Kurowski: I have to acknowledge that Max Kaiser show not brainy and about as subtle as a ghetto blaster. Your AAA product brainy, and superior. If I thought I had the brain and/or wit to add to the tale, I would do so. I will follow its progress with continuing interest. Tks. As for the Hoenig speech, I thought it was ndeed accessible, clear, sensible, thoughtful, and to the untutored eye, good to go. Who will press the action button and when? 1. I wonder why FDIC has been so woefully underfunded during the bubble time. 2. Instead of bailing out the looters at AIG, Citi, BoA (Merrill), GM, etc, if the US government used all the injection fund to prop up FDIC, I wonder how different the potential outcome would have been? It is a disgrace that not a single CEO of bailed out companies had to go, and refund ill-gotten bunuses. Are we at the point where we should adopt a classical analysis and look at the future in the categories of Plague, Famine and War – When and in what form will they manifest themselves? Nothing like a fundamental approach when all else fails. A textbook example of tunneling, described before it became part of our everyday lexicon thanks to Simon. This partly explains why the courts were avoided vis-a-vis failure to perform on derivatives CONTRACTs, for those not following this too closely. One is left in a state of slack-jawed amazement at the recklessness on display. To get to a point where one counterparty can lob a $20-BILLION shell into your balance sheet bespeaks an ungodly lack of internal controls, and hubris. I object to mike’s comment. The Baseline Scenario is no place for such communication. It is a serious sight, a serious undertaking and greatly helpful in understanding an overwhelming challenge to each and every one of us. Thanks, I marked it as spam. Our spam filter usually gets these but it makes mistakes sometimes.